This is such a pretty plant. Graceful tallish fronds of soft white/pink four-petalled flowers which look lovely for a good length of time in any garden border. 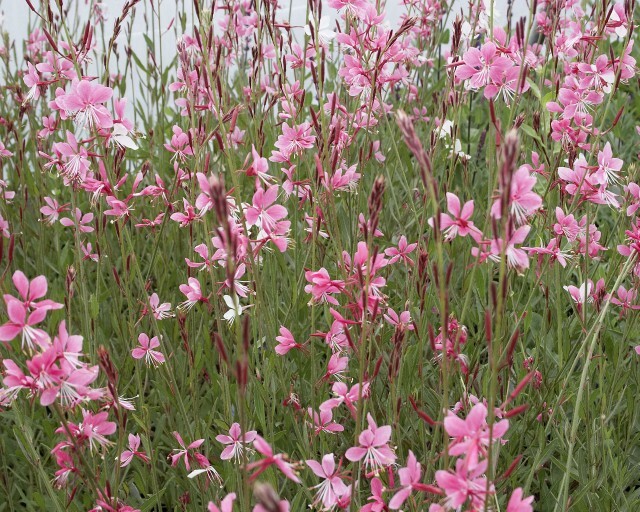 The name Gaura is from the Greek Gauros meaning ‘superb’, and relates to the striking flowers. G. lindheimeri is a bushy perennial from Texas and Louisiana with slender erect stems bearing small spoon-shaped leaves. From late spring to autumn it carries long panicles of starry white or pink-tinged flowers. It is a great late summer performer that adds a light touch of airiness to a border. It is also noted for being drought tolerant. It likes a fertile, moist but well-drained soil in full sun, but dry soils and partial shade can be tolerated. It reaches 1.5 metres in height and up to 1 metre in width. It is a clump-forming herbaceous perennial.